Two years ago, Maria Genitsaridi left behind the only life that she knew to live and play volleyball in the United States. Leaving her parents and younger brother in Greece, Genitsaridi boarded a plane from Crete bound for Pittsburgh. 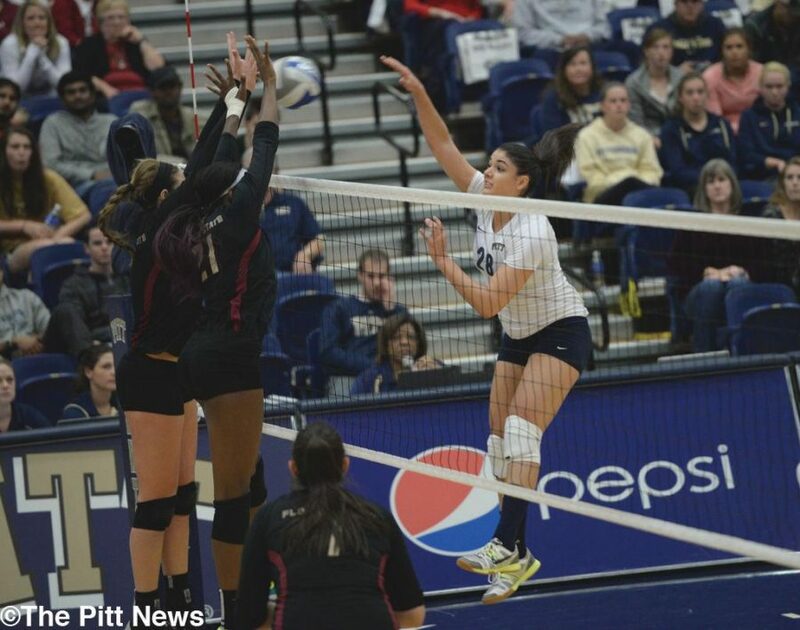 Now Genitsaridi, a sophomore outside hitter, is helping the Pitt volleyball team (18-3, 6-2 ACC) continue what has already been an excellent season. “The first year was really hard for me to get used to it,” Genitsaridi said. Coach Dan Fisher and the Pitt volleyball program offered Genitsaridi the opportunity to play collegiate volleyball, something no other college did — Pitt was her only offer. Discovering Genitsaridi, Fisher said, was a lucky break. “Usually, when you ask about another player in the video, if you can even find out that information, they’re 33 years old and professional,” Fisher said. After discovering Genitsaridi’s identity, the coach spearheaded the recruiting through networking. “She’s not the biggest jumper, but she’s very powerful. She has a strong arm and she’s a good ball control player. She’s a steady player and a steady presence on the court,” Fisher said. In only a year, Genitsaridi’s English has improved, and, Fisher said, she brought a relaxed temperament to the court from the outset. Genitsaridi started playing volleyball as a teenager through encouragement from her father, even though no one in her family had ever played the sport. Her mother played basketball recreationally. “I first played volleyball when I was 13. My dad made me go on a club team and from the first day, I loved it. So here I am,” Genitsaridi said. The recruitment to Pitt was the easy part. Acclimating to the environment was tougher, but Fisher and the coaching staff walked her through the SAT and Test of English as a Foreign Language processes. “It’s a lot of work to take all these tests … but she just kept plugging away,” Fisher said. Now a sophomore, Genitsaridi is experiencing the challenges of being a student-athlete. Along with attending classes, the team practices for about three hours a day and travels across the country for tournaments and matches. Before playing in the ACC, Genitsaridi played for three Greek clubs as well as the Greek National Team. “The head coach of the national team goes to places and sees the best kids from the area play together,” Genitsaridi said. She added that the team picks 22 players from around Greece, then narrows the list to 12 players. “I first played when I was 16, so almost five years on the national team,” she said. “We’re lucky to have her. She’s really funny and a hard worker,” Orchard said. Genitsaridi, who lives with sophomore teammate Ellie Burns, spends her free time with her teammates and takes part in typical activities for college students. Genitsaridi said she enjoys food but added that she thinks Greek food is undoubtedly superior to American food. When Genitsaridi does get more time away from school and volleyball, she hopes to travel around the country. While teammates, especially Orchard, would love to visit Genitsaridi’s home of Crete and its famous beaches, Genitsaridi has a few other prospective getaways, including New York City and Miami. “I want to go to all the famous American places,” Genitsaridi said. She said she hopes to see the big cities with historical significance. Genitsaridi’s time at Pitt isn’t just educating for her. Her teammates, such as senior opposite Mechael Guess, are learning a few things, too.